Just in time for ILMF 2016, the makers of the open LASzip LiDAR compressor annouce the latest addition to their LiDAR processing software LAStools. The new ‘laspublish‘ from rapidlasso GmbH creates stand-alone Web Portals for interactive 3D viewing of LiDAR points and for selective downloading of LAZ or LAS files. The new tool is based on the cutting-edge streaming point cloud viewing technology of Potree that optimizes large LiDAR point clouds for streaming via the Web such that anyone can visualize, explore, and (optionally) download them with any modern browser. The interactive 3D viewer streams on demand only the relevant parts of the point clouds. It not only visualizes the LiDAR in many useful and intuitive ways, but is also equipped with measurement tools to calculate distances or areas and profile or clipping tools for close-up inspections. With its integrated LASzip compression, options to color LiDAR by classification, return type, intensity, and point source ID, stunning visuals via Eye Dome Lighting (EDL), and the optional 2D download map, the new ‘laspublish‘ empowers professional and novice users alike to create stand-alone LiDAR Webportals with just a few button clicks. The new ‘laspublish‘ is now an integral part of the LAStools software and is bundled together with all necessary components of the Potree software. It provides an instant and cost-effective solution for generating a set of Web pages that realize a self-contained LiDAR portal offering interactive online visualization and exploration as well as easy and intuitive distribution of large LiDAR data sets via the optional download map. Technology powerhouse rapidlasso GmbH specializes in efficient LiDAR processing tools that are widely known for their high productivity. They combine robust algorithms with efficient I/O and clever memory management to achieve high throughput for data sets containing billions of points. The company’s flagship product – the LAStools software suite – has deep market penetration and is heavily used in industry, government agencies, research labs, and educational institutions. Visit http://rapidlasso.com for more information. As the only Diamond sponsor, rapidlasso GmbH has been the main financial supporter of the open source Potree package by Markus Schütz over the past two years. 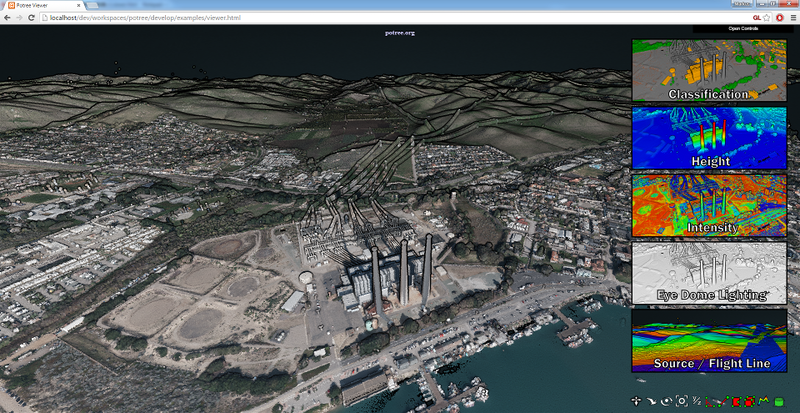 Potree is a WebGL based viewer for large point clouds. The project evolved as a Web based viewer from the Scanopy desktop point cloud renderer by TU Wien, Institute of Computer Graphics and Algorithms. It will continue to be free and open source with a FreeBSD license to enable anyone to view, analyze and publicly share their large datasets. Visit http://potree.org for more information. Just in time for INTERGEO 2015, the Potree software was released in its latest 1.3 version. Potree is a WebGL based point cloud viewer for very large datasets. The Potree software allows to publish large LiDAR point clouds on the Web such that anyone can explore the data with nothing more but a modern browser. The interactive 3D viewer not only visualizes the LiDAR in many useful and intuitive ways but also comes with tools to perform various measurements. As its only Gold Sponsor, rapidlasso GmbH is the main supporter of this powerful open source package by Markus Schütz. In the near future the Potree software will be distributed together with the LAStools package to offer a one-click solution for generating Webportals that host and distribute large LiDAR data sets and offer interactive online visualization and exploration. Potree is open source software that is free for anyone to acquire and to deploy. Please remember that using open source software is not the same as supporting open source software. Given the positive experience that rapidlasso GmbH has had with Potree we can only encourage other geospatial companies to support with time or money those open source projects that help your business.